1. Your response to the report? 2*. 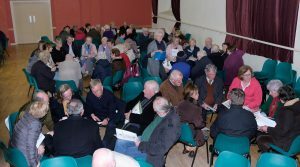 (a) How can we, as a parish, use this discussion document to inform and guide us in planning and action – next immediate steps? 2*. (b) How can we, as a diocese, use this discussion document to inform and guide us in planning and action – next immediate steps? 3. What might be needed to support these next steps? Wednesday, May 22nd 2019 – Parishes of Murroe & Boher, Ballina & Boher, Ballinahinch & Killoscully, Ballybricken & Bohermore, Caherconlish & Inch St. Laurence, Cappamore, Doon, Kilcommon, Hollyford & Rearcross and Newport, Birdhill & Toor – The Millennium Centre, Caherconlish @ 8.00pm. We look forward to your participation to help guide our next steps. With good wishes for Easter.